Florida Gators guard Scottie Wilbkin (5) drives to the basket as Auburn Tigers guard Chris Denson (3) and guard Malcolm Canada (21) attempt to stop him. AUBURN, Ala. — The Southeastern Conference has rules about storming football fields and basketball courts after huge wins by the home team. The league already hit Auburn with a $5,000 fine for the fan flood that ensued after a certain field goal returned for a touchdown two months ago. The next such offense will cost the school $25,000. It’s possible, though, Auburn officials gladly would have written that check Saturday, what with the Tigers threatening to upend seventh-ranked Florida in the final 90 seconds and seeking the program’s first win over a top-10 team in 12 years — and the first at home in 21 years. 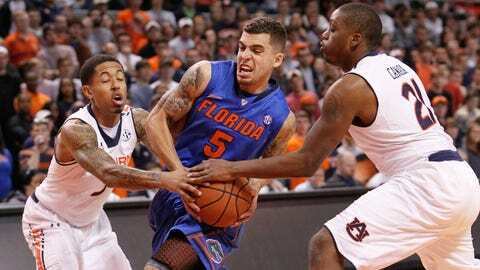 Down by just a point, Auburn’s defense had Gators point guard Scottie Wilbekin in a scramble-mode bind, with the shot clock about to expire and Auburn Arena set to erupt. That’s when Wilbekin drove left of the lane and rose up, with guard Allen Payne in his face, to hit a 10-foot jumper — his second money basket on the SEC road in a week. From there, the Gators defended and hit enough free throws to close out the Tigers (and their party-ready fans) for a 68-61 road victory before 8,683. "Sometimes, you just have to grind things out and find a way to make a play," Wilbekin said. "We had to do it again today." When the final horn sounded, Auburn’s fans headed for the exits rather than the court. Big pressure. Big shot. Big win. Not unlike last Saturday when Wilbekin willed his team to overtime at Arkansas by banking home a money basket with two seconds to go in regulation. "That’s just Scottie being Scottie," fellow senior Casey Prather said. True, but Florida’s ninth straight victory had a lot to do with Casey being Casey. Prather, the UF forward and leading scorer who missed the previous two games with a bone bruise on his right knee, came off the bench to tally a team-high 21 points on 8-for-10 shooting and six rebounds. Prather came into the game leading the SEC with a 62.4 shooting percentage. "I’m not so sure, if he’s hurt this game, that we could’ve pulled this one out," UF coach Billy Donovan said. The Florida staff planned on keeping a cautious eye on Prather in case the senior slasher showed signs of the injury lingering. Any concerns soon evaporated. "All that went out the window when he scored 16 in the first half," Donovan said. "He was going to get more minutes." Wilbekin finished with 16 points, scoring 10 in the second half, and senior center Patric Young had 13 points, six rebounds and two blocked shots, the second coming with 23 seconds to go in a two-possession game. With the win, the Gators (15-2, 4-0) sit alone atop the early SEC standings after Texas A&M, the league’s only other unbeaten at the start of the day, lost on the road at Mississippi State. They did it with second-leading scorer Mike Frazier being shut out and despite carding just 10 assists and surrendering 16 points off 14 turnovers. That because they bowed up on defense with the game in the balance. Make that seven wins in nine games decided by single digits. "We’d been here before this season, so we had respect for the situation," Prather said. "We expect to keep our composure and keep our heads in these situations … even when our hearts might be pounding. We did a good job of taking care of business." Did a good job of making the game interesting, too. Florida led by 13 with just under five minutes to play in the first half. The score at the time was 27-14. "Pretty good defense," Donovan said of the guarding UF did through the first 15-plus minutes. He had a different opinion about the last five minutes of the half, when the Tigers (8-7, 0-4) scored 14 straight at one point and were within one, 33-32 at the break, thanks to 5-for-5 shooting from 3-point range. 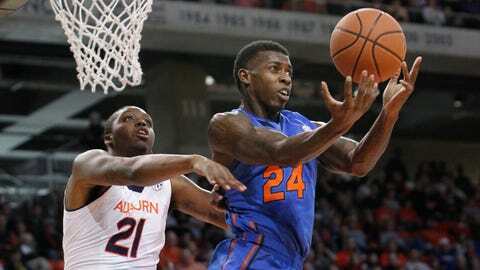 Forward Casey Prather returns from injury to help lead the Gators past the Tigers on the road. UF came into the game with a plan to defend Auburn’s pick-and-roll offense, keyed by the backcourt tandem of Chris Denson (19.4 points per game) and KT Harrell (19.0) that ranked 1-2 in the league in scoring. The Gators started well, but Denson and Harrell found their rhythm in drives and pull-up jumpers and went on to finish right on their scoring numbers, combining for 39 points. But the Tigers just needed more. And they needed it late. "They made plays down the stretch," Auburn coach Tony Barbee said. "We didn’t." The Gators led by five, 62-57, with four minutes to go when Denson drove through traffic — he did that all day — to bank in a layup high off the glass at the 3:54 mark. UF had a couple possessions to extended the lead, but Dorian Finney-Smith had his shot blocked and Wilbekin turned the ball over. Auburn forward Tahj Shamsid-Deen made a jumper that drew the Tigers to 62-61 with just under two minutes to go. On UF’s final possession, Wilbekin had a split-second chance to drive the ball, but opted to back out and look for something else, basically rocking Payne and searching for something, anything, as the shot clock ticked down toward zero. "We didn’t really have anything going on that possession," Wilbeken said. "My first drive, I tried to give it to Casey coming around behind me. His man denied him, so I had to make another move." "When Scottie was doing that stuff that he was doing, all that dribbling, I was just like, âGet up a shot up — period!’ " Young said. "But he was the man who had to take the shot. He needed to be the guy." Harrell missed a 3-point attempt on Auburn’s end, Young rebounded and fed the ball to Wilbekin, who was fouled. He made one of two free throws with 48 seconds to go, taking the lead to four. This time, Harrell drove the lane and tried to put a shot up through Young, but the 6-foot-9, 240-pounder held his ground, blocked Harrell’s attempt with both hands and ripped the ball free. "It was like a volleyball player at the net," Young said. From there, Florida made three of four free throws to pad the margin, as Auburn failed to score a point for the final 1:59, almost exclusively playing from 2-3 zone. "Florida has the best defense I have ever seen," said Denson, who finished with 21 points. "I missed a lot of layups in the first half, but I think it was a little bit of nerves. Playing the No. 7 team in the country, I was just anxious." So were the the Auburn fans.